The congressional probe into the water shortage in Metro Manila and parts of Rizal began Monday, with the chief executive of Manila Water Company Inc., one of two private concessionaires, apologizing for his company’s failure to fulfill its contractual obligation to provide non-stop water service to its six-million customers. The admission was a step forward from his company’s original attempt earlier this month to blame the service interruptions on the El Niño, and the dwindling water levels at the La Mesa Dam as a result of the lack of rain. That rationalization rang hollow when people realized that the other water concessionaire, Maynilad Water Services Inc., experienced no similar shortage, and that both of them were supposed to draw water from the Angat Dam. If the shortage was indeed the result of the El Niño, it should have been felt by both concessionaires and the households and business establishments they serviced, and not just Manila Water’s franchise area. Moreover, the Metropolitan Waterworks and Sewerage System pointed out that Manila Water was supposed to go to La Mesa only as a backup source, if it could no longer meet the demand of its customers using water from Angat. As tens of thousands of households of Manila Water customers saw their taps run dry for hours in Metro Manila’s east zone over the last two weeks, it was clear that something was terribly wrong with their water distribution system. What it is is not exactly clear, but we trust that the ongoing hearings give us a better picture of just what went wrong, and how it might be prevented from happening again. It was disconcerting, however, to hear the MWSS administrator first say that his agency had no powers under the law to impose penalties on concessionaires that failed to fulfill the terms of their contract—only to later say that there were provisions in the concession agreement after all to penalize Manila Water. If this is a point of ambiguity, it is something Congress needs to clear up and settle as a result of its hearings. Amid the simmering anger surrounding the water shortage in Metro Manila, it is but natural to ascribe blame and to call for penalties on those who caused it. Certainly, calls for a refund for Manila Water customers would not be unreasonable. 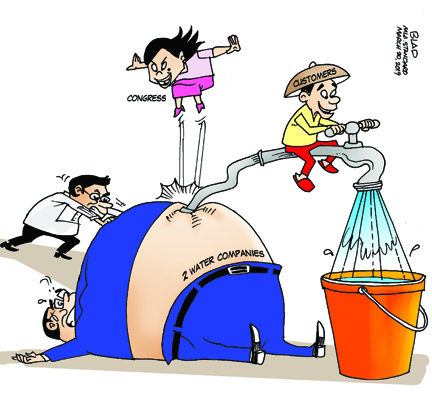 But, as House Speaker Gloria Macapagal Arroyo suggested, lawmakers need to move forward and keep an eye on the vital objective of ensuring an adequate water supply for all.